High Quality, Great Service, Customer First!! Product material:alloy, copper brass, 925 sterling silver, 316 stainless steel, agate, jade, stone, shell, pearls, ceramics, glass, plastic, wood, fabric and other materials made. Guangzhou Yulaili Fashion Jewelry Co., Ltd was established in 2008. We are the professional jewelry supplier specialized in the design, production and sale of the fashion jewelry accessories such as nacklace, bracelets, rings, earring, hair ornaments, alloy jewelry set ect. All of our products are eco-friendly which are nickle free, lead free and low cadmium. Many of our customer are from USA, France, UK, Nigeria, German and other European countries,We always provide high quality and efficient service, and working with enthusiasm , who keep a long term business friendship with us. We both do retail and wholesale. 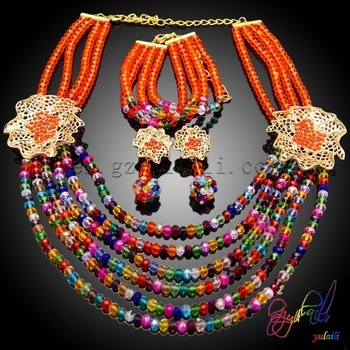 Wholesale: all styles of our products. Retail: New design stock products in stock,MOQ:10sets same or different styles.